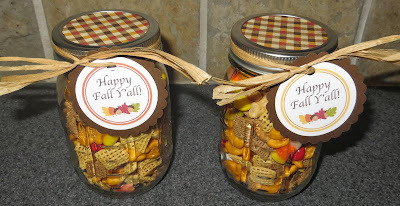 I made this Fall Snack Mix for my kids' teachers. The snack mix contained Wheat Chex, Rice Chex, Cashews, Candy Corn, Goldfish, Honey Roasted Peanuts, and M&M's. I put the snack mix into small mason jars. Then, I used my 2.5" circle punch to punch out fall-colored scrapbook paper to put on the top of the jar. I used my 2.5" scallop punch to punch brown scrapbook paper and then mounted these cute "Happy Fall Y'all" tags on top (tags available from Make Bake Celebrate HERE). I hole-punched the tags and attached to the jar with natural colored raffia. It was easy and the teachers loved to have a snack during their school day!